Located in Porto Feliz, Brazil, this amazing single family residence was designed in 2016 by Candida Tabet Arquitetura. Nestled longwise into the site and arranged in a semi-circle plot, this one main storey, a mezzanine and an annex playroom house designed for a couple and two children focuses on leisure and family life. Following client expectations, it plans to maximize the beautiful view to the horizon and to emphasize circulation between the different rooms promoting conviviality, contemplation and inviting to idleness. The design composition gains rhythm through the mix of the standard ceiling height of the aligned bedrooms area and the double ceiling height of the social area with a mezzanine placed at its center. In addition to the aesthetic function, the great ceiling height potentiates crossing ventilation and allows hot air to rise improving thermal comfort. 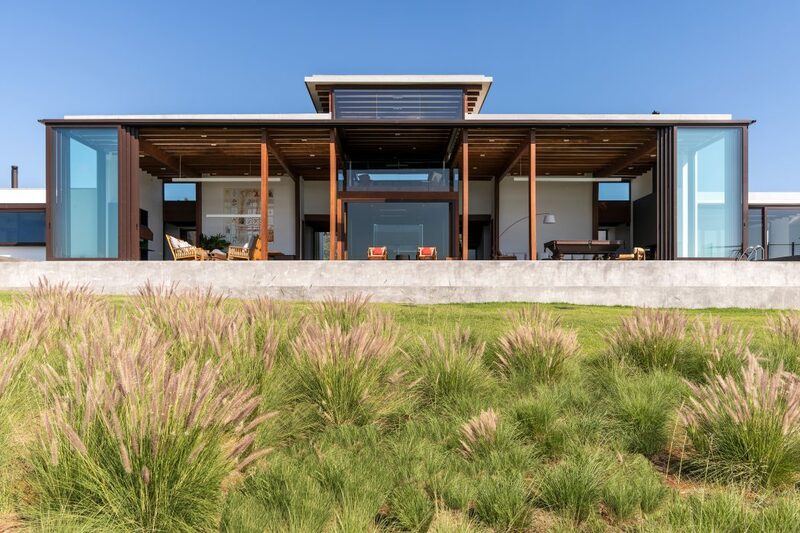 The ACP house is structured by a striped pattern of wood porches and beams of sustainable solid Cumaru wood. The roof was built with processed boards and waterproof membrane in order to avoid the use of water and provide faster construction.